London: European shares rose in early trade on Thursday, as investors bet on a rate cut from the European Central Bank and a bold plan at an EU summit to help resolve the euro zone debt crisis. At 1:35pm, the FTSEurofirst 300 index of top European shares was up 0.7% at 995.18 points, near its highest in more than five weeks. Stocks rose across the board, with the heavyweight banking sector among the biggest gainers. The STOXX Europe 600 Banking Index rose 1%. France and Germany are to sound out European leaders on Thursday about their plan to defuse the euro zone’s debt crisis, which includes tougher budget discipline, eager to rally support before a high-stakes EU summit. 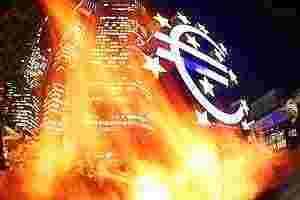 Strategists said the market was also pricing in the ECB starting quantitative easing. Jeremy Batstone-Carr, strategist at Charles Stanley, said the market could fall 6 percent if the ECB did not indicate it would print money and only “vague platitudes" emerged from the summit. “I can’t see where a continuation of this rally is going to come from," he said.